If you click and drag a result from a results map to a sequence window it will be annotated as a feature. 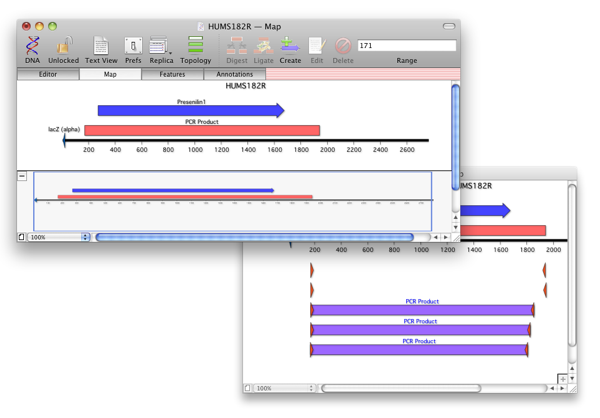 For example dragging a primer from a primer results map will annotate that primer as a MISC_BINDING feature in the sequence (see the screenshot where the PCR product has been annotated). Once a result has been annotated it will be hidden from the results window to avoid adding it in duplicate. Incidentally as well as dragging and dropping results, there’s many other places where drag and drop has been added to MacVector over the past few releases. Oh and do remember that ALL annotation created from within MacVector is fully compliant with the Genbank Feature table specification. This entry was posted in Releases, Tips and tagged annotation, genbank. Bookmark the permalink. Both comments and trackbacks are currently closed.